An ode to Mexico’s rich heritage of indigenous dance. Amalia Hernández was born in Mexico City in 1917 and saw her first local dance performance when still a young girl. Entranced, she determined to become a dancer, and with her parents’ encouragement, she began to study ballet and, later, modern dance. She then started to choreograph, basing her steps on “folkloric danzas” similar to what she had seen as a child. Hernández followed this first foray by forming her own small troupe and fashioning numbers based on Mexico’s many different traditions and indigenous danzas. Her work melded old traditions with ballet and modern dance and was filled with drama, featuring colorful costumes and sets. Works based on Mexican history also became part of her company’s repertoire, along with music from Europe such as the waltz. National and international success and acclaim followed for her company, El Ballet Folklórico de México. 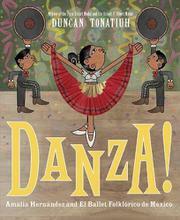 Tonatiuh tells Hernández’s story with careful attention to detail and with obvious admiration for the subject, adding in his author’s note how popular Mexican dance is across both Mexico and the United States. His digitized, hand-drawn illustrations are striking. They showcase, in his signature style based on Mixtec art, the beauty and grace of many different dance styles.